As mentioned in an earlier post I ordered a GERBER SHORT STACK AR15 TOOL from Midways Amazon store. Now available from Cabelas, the GERBER SHORT STACK AR15 TOOL is everything I expected and more. You can see a list of features on the previous post linked above. No reason to repeat myself. First thing I notice is the finish. Feels exactly like a phosphate coated bolt carrier. I like that. The second thing is the tool is first rate quality in fit and finish. The GERBER SHORT STACK AR15 TOOL is strong, hard and seems to be made with precision. So far so good. 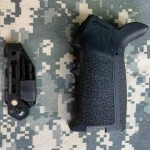 Installation – First thing I needed to do was remove the bottom cap of the MAGPUL MOE PISTOL GRIP. Always a challenge for a guy with some physical challenges. Once the end cap was removed the Magpul supplied rubber tool holder needs to be removed to allow the GERBER SHORT STACK AR15 TOOL to fit properly. The GERBER SHORT STACK AR15 TOOL sits about flush with the end of the MAGPUL MOE PISTOL GRIP. I was concerned the tool would rattle as that would be annoying to put it mildly. It does not. It’s actually a perfect fit. All in all Im quite pleased with the GERBER SHORT STACK AR15 TOOL. Be curious to see if other tools develop from this line.